← Yom HaShoah- Holocaust Remembrance Day Why Remember? Write on- Well, only if I can Tweet or Pin it. I saw a cartoon the other day of a writer’s desk and it brought to mind how intrusive social media can be. 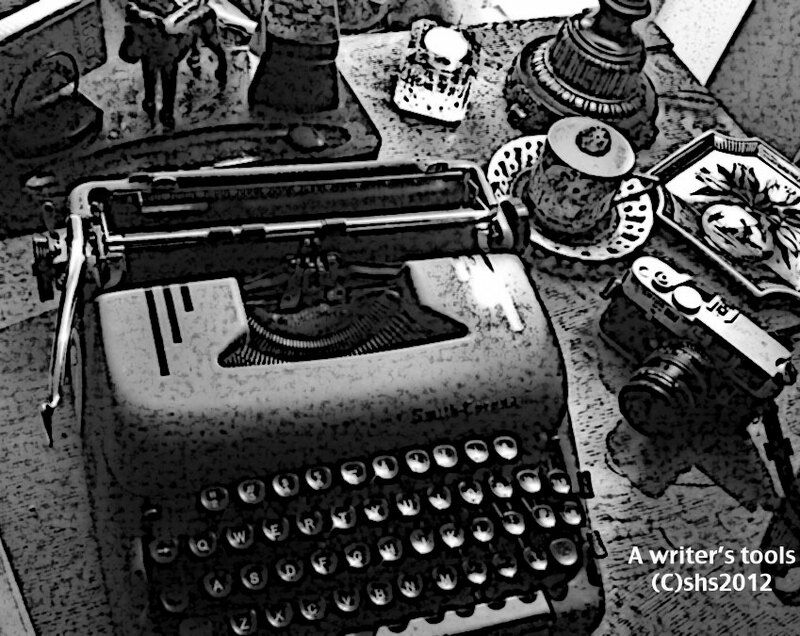 The cartoon desk was loaded with social media icons and the actual typewriter or pen to do the writing was buried under Pinboards, Tweet piles, Facebook messages, etc… Sometimes it’s hard to remember social media is a tool to connect with readers and other writers, and it cannot be the end all. You can’t just Tweet, Pin it, Blog it, Facebook it, Google Plus it, Digg it, Tumble it, Reddit, Link it, Stumble it. ( have I left anyone out? ) It quickly becomes madness. There has to be time to answer emails, connect with your readers on a personal level, not just my new book is out ad nauseum. How about time to do actual writing? I was reading an article on the web and there was a place for comments. I like reading comments and seeing the reaction to an article written, but this comment author, who shall go unnamed, wrote..my new book about blah blah blah and I just groaned! Seriously? What on earth does this have to do with the article? Don’t you have an opinion? Your reader’s might find it interesting. I get the need to find readers and with everything spread so thin and with so many people trying to get the same reader…I get the frustration. I want readers also. But this kind of abusive commenting on articles or postings will not get me to read the book, and particularly, I will not recommend it. I have a deep distaste for that author’s book without even seeing one word that the author has written. It might have been brilliant! Social Media is also not just a banner for your latest work..( there is so much of this out on Twitter)- Newest book, read my novel, it’s the best, and actually very little social engaging. Any one who follows me on Twitter is clearly aware that I am hopeless at it. I don’t tweet other than to comment on other people’s tweets, or retweet something I find interesting, or let everyone know my blog post is out. I clearly am not an outstanding Twitterer. Tweeters out there…HELP! I just don’t get how to tweet! Not being on Twitter for a long time, I find that some tweet the same thing day after day, all geared to do one thing, sell. You might ask what is the point of writing if you can’t share it with your readers? Point taken, but I think readers, and I could be wrong, would like to learn a little bit about you. Bare everything? I think not. Tweet my latest coffee choice? ( Americanos) I think not. But I would like to see more comments on the world around them. What books are they reading now? More engagement with other writers. There is one tweeter who actually tweets as their character in their book? How are you supposed to respond to a fictional character? Sorry, I just don’t engage like that. I’ve settled on two main places to ” sell” I tweet and Facebook Page, and the rest….if something better comes along and I hope it will, I will move over, but you can’t spread yourself so thin that all you do is social media. How are you managing your social media? Have you tamed your beast? Can I possibly learn to be an amazing Tweetie Pie? This entry was posted in writing and tagged Author, Authors, Blog it, Digg, Facebook, Fiction, Google, Novel Writing, Pinterest, Redit, Social media, Social network, Stumble, Twitter, writing, Writing the Novel, Writing Tips, Writing Tools. Bookmark the permalink. 14 Responses to Write on- Well, only if I can Tweet or Pin it. On WordPress, you can set up your blog posts to go to Twitter automatically. I’ve done that, and it does save time. I always try to thank everyone who shares my posts, and I always try to talk back to people who talk to me. When I have time, I retweet articles and posts that I found interesting. In total, I probably spend 10 minutes per day max on Twitter. Andra Great Advice! Ten minutes a day sounds very manageable! Most of my time on Twitter is spent interacting and joking with others. I know I should use it more for marketing (or should I? ), but other than an occasional tweet about my book, I don’t mention it, mostly because I know how annoying it is to get bombarded with tweets like that. It’s really about the interaction. If people want to check out who you are beyond your tweets, that’s fine. If they don’t, that’s fine, too. I so agree! I just can’t think of anything I need or want to tweet about on a daily basis. Sometimes I feel it’s like going out into the middle of town and just shouting out. Someone might be interested or not! 🙂 Wonder if I should try that in real life! There seems to be lots of us on G+ Susan… you should check it out! Hi Charlene thanks for your lovely comments! I appreciate you faith in my Tweeting abilities! 🙂 looking forward to reading your post! Hi Tom, just did and am now learning how to Circle, but I hope with some point in mind!